and it’s chock-full of the area’s most festive happenings for your planning pleasure. Kick things off the Sunday after Thanksgiving and bring the holiday cheer to a variety of events that celebrate the season in the Pacific Northwest. 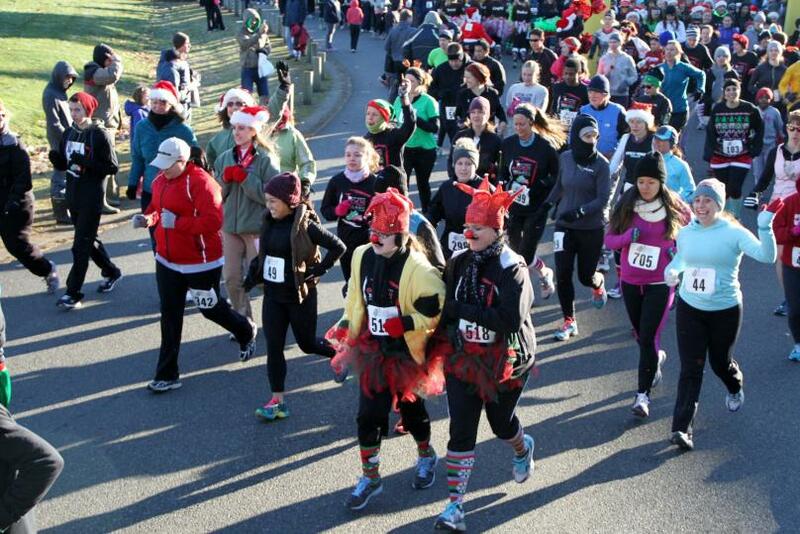 Catch the Parade of Lighted Ships from a cozy waterfront restaurant or burn those extra holiday calories along the wooded course at the Jingle Bell Run. Santa and his entourage are slated to make several appearances throughout the month. Tis the season for celebration, read on and be merry! Downtown for the Holidays, Sunday, Nov. 27. Wrap up those Thanksgiving leftovers and prepare for the holiday season at Downtown Olympia’s “Downtown for the Holidays” celebration. Get in the spirit from noon to 5 p.m. with festive light displays, gingerbread houses, wagon and trolley rides, photos with Santa and a tree-lighting ceremony. Bundle up and stroll Capitol Way or come for the parade at 3 p.m.
Jingle Bell Run, Saturday, Dec. 3. Run, walk or stroll the five-kilometer route on Saint Martin University’s beautiful wooded campus. See the decorated Christmas tree in front of Old Main Street, enjoy festive fun at each mile marker and perhaps even encounter a deer or two on the course. Afterwards, recharge with a cup of cocoa or cider and Christmas cookies, and have your photo taken with Santa. Parade of Lighted Ships, Saturday, Dec. 3. This scenic lighted ship parade begins downtown at Olympia’s Percival Landing and sails to quaint Boston Harbor and back. Find a seat at any number of waterfront restaurants or bundle up and watch the bedecked boats from a cozy waterfront vantage point. 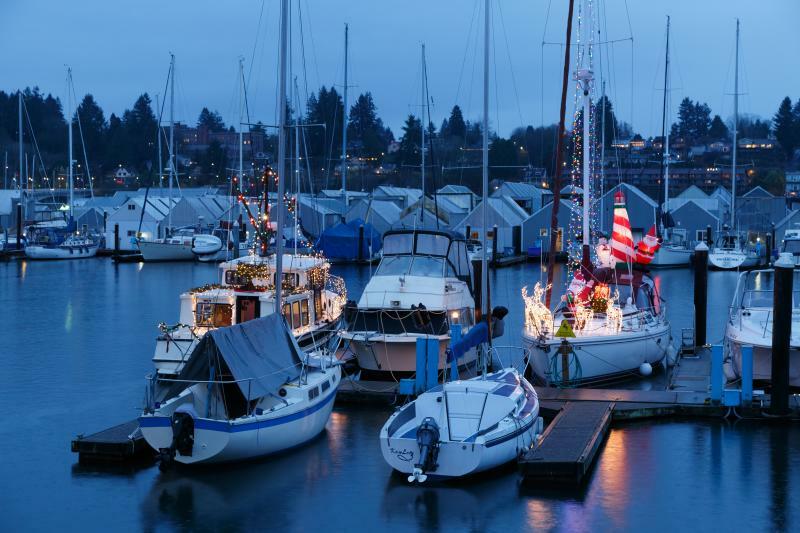 The ships begin the parade at 6 p.m. from Olympia Yacht Club’s perch at Percival Landing, head to Boston Harbor and return by 8 p.m.
Lacey Parade of Lights, Monday, Dec. 5. Settle in for a community event like none other as lighted vehicles and floats of all kinds travel the streets of Lacey. In celebration of the town’s 50th anniversary, this sparkling spectacular – which includes Lacey Fire Department&apos;s Santa Mobile featuring Santa himself - begins at Lacey Boulevard and Sleater-Kinney Road at 6 p.m. and culminates at the tree-lighting ceremony at Huntamer Park. Following the tree-lighting and weather permitting, enjoy "How the Grinch Stole Christmas" on the big screen, while visiting with Santa. Tumwater Christmas Tree Lighting, Saturday, Dec. 10. Get in the spirit with the Annual Christmas Tree Lighting Festival in Tumwater. Held Saturday, December 10 from 2-5 p.m. at the Tumwater City Hall and Fire Station, this festive community event includes games, holiday crafts, performances by local and school choirs and the lighting of the tree. Santa will arrive on an antique fire truck after the ceremonial tree lighting. Make a holiday weekend of it and find options for lodging, dining, entertainment and recreation at www.visitolympia.com. Connect with the Olympia-Lacey-Tumwater Convention & Visitor Bureau on Facebook, Twitter (@Experience_Oly) and Instagram (@VisitOlympia). As Zagat recently reported, “it’s official, Olympia has scooped Seattle when it comes to food halls.” Washington’s newest food hall, 222 Market brings local, artisan producers under one roof for one-stop shopping, dining, drinking and more. Anchored by the renowned Bread Peddler -  multiple winner of Washington’s Best French Bakery – 222 Market welcomes eight additional purveyors ranging from a bone broth bar, an oyster bar, a cooking school and more. Come see what the buzz is all about at the opening of 222 Market this weekend. Sip, sample and celebrate with the owners, chefs and culinary partners involved in the new community gathering place. The festivities begin at 12 p.m. with a ribbon cutting ceremony at 1 p.m. The fun runs until 5 p.m. with live music, prizes, food samples and more. Find more information or RSVP at www.222market.com. 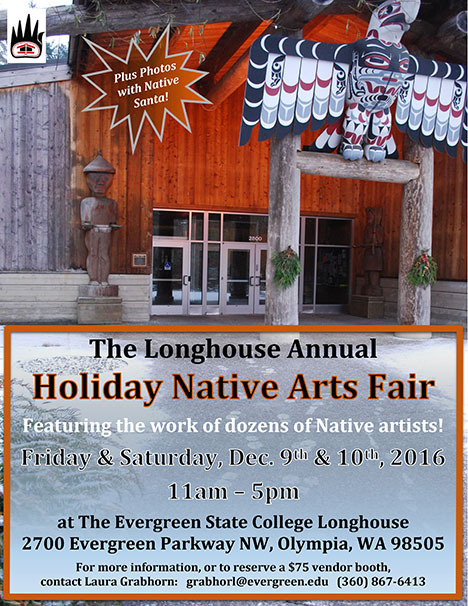 Find unique art and holiday treasures at the Longhouse Annual Holiday Native Arts Fair! Featuring the work of dozens of Native artists, visit The Evergreen State College Longhouse on Dec. 9 and 10 from 11 a.m. - 5 p.m. to explore and learn more about this amazing local culture. There will even be a Native Santa to take holiday photos with!